Having Barrels and Barrels of FUN! 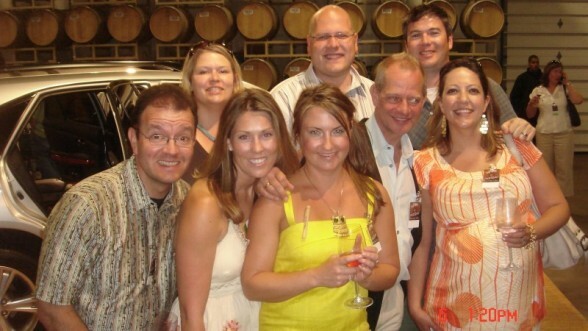 Take a look at all of these happy people enjoying the Napa Valley Barrel Auction. It was a good day. No, it was a great day! No work, beautiful weather and lots and lots of vino. Personal highlight…spotting Oprah Winfrey in an outfit that was the same color as my dress. Boy did I feel special! This is my 6th year attending the Barrel Auction – it is one of my favorite events of all time and I really do think it gets better and better every year. This year it was at Trinchero Family Estates where large tents were set out on the lawn for wineries and restaurateurs to showcase their goods, and inside the barrel room you could taste 128 barrels of wine right out of the barrel. Rumor has it that 3,000 people were in attendance that Friday afternoon. It’s a small valley, but we know how to throw one hell of a party! Hats off to the Napa Valley Vintners for raising $10.35 million over the weekend…that is quite a sum and will do lots of good! I was there and I have to agree; yes, it was fabulous. Do you have any pics to share? I didn’t have a camera, but I think Britt did. I am going to post the pic of us standing in the barrel room. All happy and glowing.